This amazing illustration was supposed to be in the last section of DINOSAUR MUMMIES but it got cut at the last minute. I still love it. Halls begins with a personal account of her lifelong fascination with lizards and dinosaurs and her excitement upon learning about mummified dinosaur fossils. Though bones are the most common dinosaur fossils, occasionally soft tissue such as skin and muscle become fossilized. These are referred to as mummies. 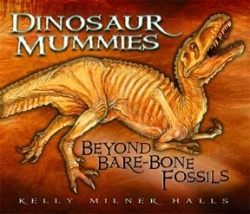 After clearly explaining the fossilization process, the book spotlights six significant dinosaur mummies, from the 1908 discoveries of an Edmontosaurus skeleton wrapped in its skin to the 2000 find of Leonardo, a Brachylophosaurus fossil with skin, bones, muscles, internal organs, stomach contents, and a neck pouch. Halls' enthusiasm shines through in this well researched and clearly written book. Sidebars carry information about people mentioned or quoted as well as information about various terms. Drawings washed with color show how the dinosaurs might have looked, while many excellent color photos illustrate the fossilized find, dinosaur diggers and paleontologists at work. Appendices include a glossary, list of sources, including many personal interviews and correspondence with paleontologists, fully announced lists of recommended children's books, video's and Internet sites on dinosaurs as well as a list of museums offering dinosaur digs. Solid information with a personal touch. Gr 5-8-Recent discoveries of mummified, fossilized soft tissue have given scientists important new information about dinosaurs. The author begins by explaining the process of fossilization, noting the wide difference between the mineralized mummies that paleontologists study and intentionally preserved specimens like Egyptian mummies. Then she gives the background, details, and implications of six key discoveries, starting with the Sternberg Edmontosaurus in the early 1900s. The other examples all date from the past 10 years, culminating with the 2000 discovery of Leonardo, the most complete mummified dinosaur found so far. A bit of information about each scientist is provided, along with comments from most of them about their work, so readers get a feel for the dedication and enthusiasm of these groundbreaking paleontologists. These discoveries are not only rare; they also have significant impact on our understanding of dinosaurs. The fossilized Sinosauropteryx, for example, helped confirm the existence of feathered dinosaurs, while a 66-million-year-old preserved heart supports theories of warm-blooded dinosaurs. Each discovery is introduced in a clear and lively style, so youngsters can follow the text without becoming overwhelmed by names, dates, or scientific terms. 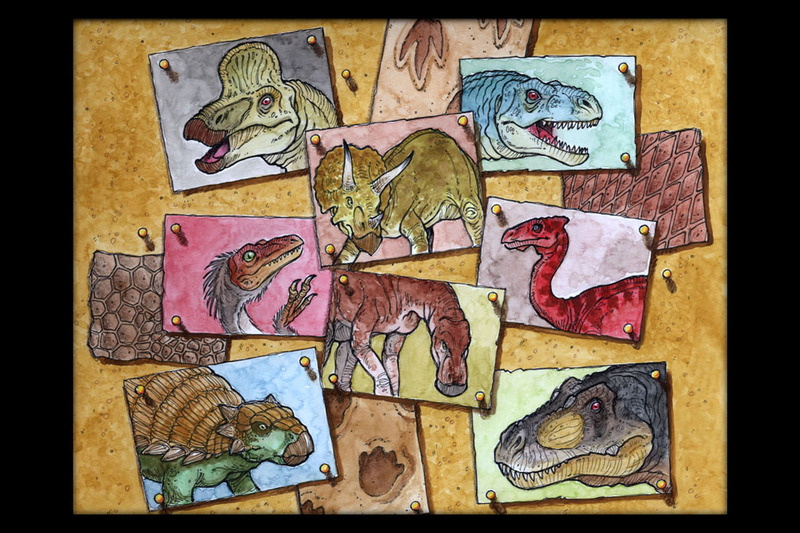 The layout is inviting, with good use of white space and many full-color photographs and drawings showing dinosaurs, fossils, and the scientists themselves. A brief "paleo-notebook" offers details on 10 other key dinosaur mummies. The current data and intriguing focus should make this a popular and valuable addition to dinosaur shelves.-Steven Engelfried, Beaverton City Library, OR Copyright 2003 Reed Business Information. "...an interesting addition to the juvenile dinosaur literature, covering as it does an unusual area. Furthermore, by providing information about the personalities and controversies associated with the interpretation of dinosaur skin and guts, it will introduce kids to the way that science actually is done."